Convince me otherwise. You can’t. I know. Don’t sweat it. Give in to it and become an art collector as well. In preparation of the previous blog post on the Marvel ARAH Special Missions #1, I came across the website of artist Mike Zeck, who did the cover art for that issue. As it happens, he is selling some Joe prints in his shop and naturally I placed an order. Below you can see the prints I got. They were shipped in very sturdy packaging and very fast considering they had to travel halfway across the globe to get here. Anyway, check out his site and shop for yourself and order some of these gorgeous prints for your mancave, study, living room or art wall. Visit the site on https://www.mikezeck.com/shop. This is just iconic! Check out the last post where I go into more detail about this Special Mission. Snake and Scars… A better couple than Kim & Kanye if you ask me. New comic book, still great cover art! Let me end by saying that this post is not sponsored in any way. I’m doing this all for the love of Joe (boy, that doesn’t sound as good as I thought it would) and my love for fine art! Support your local comic book shops and the artists bringing you joy and fun every Wednesday! Author European JoePosted on February 27, 2019 Categories G.I. JoeTags art, cobra, cover, gijoe, IDW, marvel, mike zeckLeave a comment on Comic books are art! Do you want to build an army? Wait! What? No it’s not. Question. Did Hasbro really spend $522 million on the Power Rangers? They have plenty of power in-house already if you ask me. Like the troops we’re discussing today! It’s a new year and to start it off in style, I’ve got a threat for all of you. It’s army building time! That sounds better. (Picture a kid (or adult collector) grabbing a bunch of troops and showing them to the camera whilst shouting this phrase.) Got the reference? Good, now, let’s do this! With an assorted range of Vipers and consorts, no teenagers in flashy pajamas. We’ll be going over the Impel Trading Cards #75 all the way through to #82. That’s right, 8 cards in one post. Talk about value for money! (Well, since I do all of this for free with no income whatsoever I guess every post is excellent value for money, so don’t even think about complaining. Just keep on reading, Soldier!). 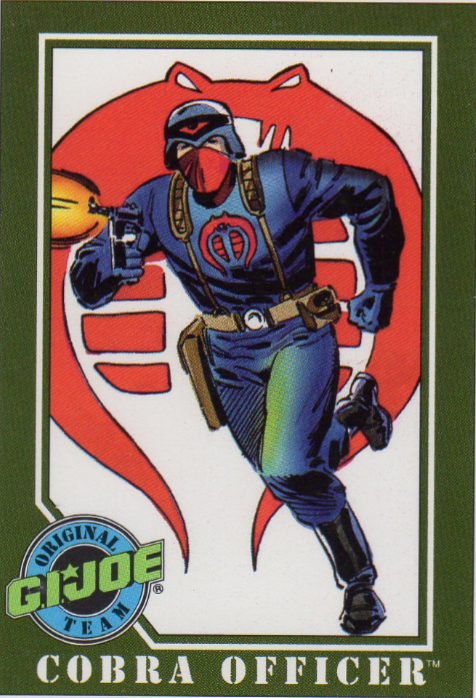 We start this rundown of Cobra underlings with #75, the Desert Scorpion. According to the file card, being a Desert Scorpion is a punishment given to under-motivated Vipers who refuse to follow orders. After one year of unblemished service, a Cobra trooper can be reinstated in the Viper Corps. Another disciplinary fiasco and it’s straight into the “Leaky Suit Brigade” (more on those a bit further. Keep on reading). What a good way to kick of this Viper-overview. Although the figure is probably not the most popular one with the fans, it is a cool concept that was missing from Cobra’s army and the figure released in 1991, came with it’s own scorpion. Here in Belgium, the figure was released with a different set of accessories and so the card art was altered as well. Apparently the market over here was more important in the past. We got altered figures, an active fan-club and oh, yeah, the European Exclusive Tiger Force! The design of the figure is quite nice. The colors all match great. The fact that the figure came with a bunch of accessories is also noteworthy. Next up is #76, the Techno-Viper. Released in 1987, the Purple Vipers (Grape Soda anyone? ), later inspired the Purple Power Ranger in the 16th (yes, you read that correctly, 16th) series. That may be true, it may be alt-truth. It’s on the internet now, so you better believe it! Next month (February 2019), Nickelodeon will be broadcasting the 26th series (the first one produced by Hasbro Studios). There have been over 900 episodes over all the Power Rangers incarnations. We really need a new G.I. Joe cartoon. But enough about that. There have been 3 versions of the Techno-Viper released. The OG grape from 1987, then a repaint in 1994 as part of the Star Brigade (2 color variations – copper vs yellow) and then in 2011 a new sculpt was released in a more subdued purple (from grapes to lavender). As it happens, I never had this figure as a kid, but it was one of the 4 figures I came across last summer on a local flea market. I must add that they were the only figures I saw all summer on flea markets. The amount of Joes on offer ‘in the wild’ has reduced drastically over the years. Sure, online there are quite some people selling of both vintage and newer Joes, but they think it’s worth more than gold… I haven’t really been expanding my collection last year, all my stuff is still in boxes until we can get around (read: save enough money) to finish the attic, so I refrained from buying new toys (apart from those 4 loose and incomplete figures). I remain buying the comics and as you nay have seen also been buying some books (Ladybird Action Force, Annuals, …). Enough sour grapes right? Let ‘s move on. And moving on takes us to #77 and presents us the Toxo-Viper. More commonly known as the Leaky Suit Brigade. As stated above, the Toxo-Vipers are on the bottom of the Cobra food chain… probably even below Croc Master’s crocs. I truly believe that nobody in their right minds would ever volunteer to become a Toxo-Viper. The whole unit is used to serve as punishment for major offenses and so it’s bad reputation makes sure that the other troops stay in line. Even though they are not loved within Cobra, the figures do have a fanbase. There have been 3 versions of the Toxo-Vipers. The original dates back to 1988. It really has a good color scheme with mainly purple and black, red and blueish accents. The suits may not be the most expensive (again to motivate the troops to work fast), but the design is nice. In 1991, the second version was released as part of the … Eco-Warriors line. If ever there was a perfect fit! The figure however is not that remarkable. It was a new mold, but, the figure is just bland in my opinion. It’s a lot of green and purple and a touch of red. Compared to the original figure, it’s definitely a step backwards. Then in 2014, the 3rd version was released as part of the Convention Exclusive Zombie Initiative box set. Unfortunately, the design builds on the 1991 version and not on the original. So again, lots of green and purple and some red. Don’t get me wrong, it’s not a bad looking figure, but far from the iconic look of the original. As I mentioned before, my collecting days are currently on-hold and I try to limit my purchases to comic books. This said, I would like to add a Toxo-Viper (1988 version of course) to my collection. If I start looking on the interwebs again to expand the collection, this one will be the first to get. Now, we’re not quite done talking about leaks, albeit not quite as toxic this time. We do get wet again with #78, the Hydro-Viper. I grew up in a small town by the coast. The sea always seemed to be there, yet I don’t feel it’s attraction. I mean, it’s no white sand, blue sea out here. It’s a brown stretch of sand with an other shade of brown or green for the sea. Not that attractive. And in summer, the beach and the town got overrun with tourists, so it was even less fun to be at. I’ve never felt the need to go into the sea. In fact, I don’t think I’ve been in more than 5 times my whole life. I always associated water with danger. And dangerous it is with Hydro-Vipers in the ocean. Another figure that got it’s first release in 1988 (Cobra really got big then). And another figure that uses a lot of purple. The figure came with a lot of cool accessories such as a helmet, fins, scuba pack, harpoon and a black devil ray. According to the filecard, the Hydro-Vipers are EELS that have been surgically altered to withstand the effects of deep diving and have webs implanted between their fingers. A lot of Cobra troops seem to be getting these alteration (DNA resequencing, Crispr anyone?). 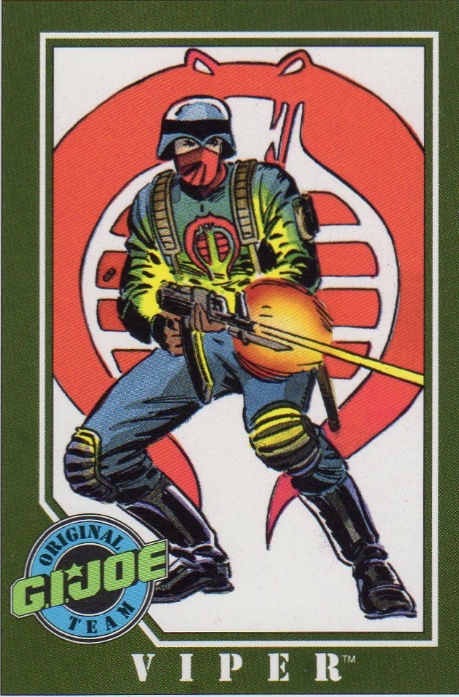 It feels like Hasbro and Larry Hama did everything to make the Cobra troops less human. No one in their right state of mind would join Cobra, they needed people that were altered. That’s it, there’s just this one version of the figure ever made. A shame? Perhaps, but we have more Vipers coming up. Let’s keep on building that army. Continuing the rundown, we have #79 featuring the Range-Viper. First released in 1990, this figure is marked as a Cobra Wilderness Trooper. The design is a strange one. It appears like the helmet is showing grey matter, yes, brains, on top and the sided, while the face is as blue mask with red eyes. The whole head reminds me of a skeleton. The colors are blue, black and a bit of yellow. Not exactly what you’d use as camouflage, but it looks scary and maybe that was the point? There have been 4 more releases, in 2005, 2006, 2009 and 2010. Only the 2006 version shares the same design of the original one, this time the colors more brown and tan and was released as part of the Operation Flaming M.O.T.H. set from the Club. I actually own this one, though I have to say that the original blue version looks fiercer. The other versions all had removable helmets that did give that skeleton vibe. The final version turned the color palette darker, with shades of black and green, giving the figure a more jungle look. I remember the Range Vipers getting some exposure in the DIC cartoon series. Not a lot of comic book appearance if I recall correctly. These troops look scary as hell and you wouldn’t want to run into them in the dark. Nor in the light. Now it’s time to take it to the stars with #80 featuring the Astro Viper. So far we’ve covered the land and sea, now we take it to the skies and above. The Astro Vipers are recruited from within the Strato Viper corps… I guess you could say it’s a step up on the ladder… Sorry, very lame pun. Now, we discussed the Strato Vipers way back when we discussed Impel Trading Card #14 featuring the awesome Night Raven, but we’ll talk about them even more when we reach #87. Stay tuned and read on for now. There have been 2 releases of the Astro Vipers, one in … you guessed it 1988 and the second version in 1993. The original figure is the one depicted on the card here. Sporting black, red and gold (yellow), the figure does pop up the radar. The second version was a simple repaint, this time in a dark turquoise and part of the Star Brigade line. Strangely enough, this latest version doesn’t include a rocket pack… I guess they had to jump or got pushed in the direction of the battle and just had to wing it. Also noteworthy is that these Vipers aren’t really soldiers, their main task within Cobra is repair and maintenance of the Cobra satellites. Technicians basically, like the Red Shirts in Star Trek (OG). And probably just as expendable too. Staying high, the T.A.R.G.A.T is on card #81. Technically they are part of Destro’s Iron Grenadiers, but hey, who’s nitpicking? Since they are members of the IG, black, red and gold are the colors we’d expect, but they’re also sporting bright blue with Destro’s logo on their shoulder/chest. I must say it suits the figure. The original figure was released in 1989 and got a repaint in 1993 as part of the Star Brigade. Where have we heard that story? In any case, this repaint is … well, bright. Gold with purple accents. And again, the coolest feature of the original figure, the backpack jetpack, is missing. The same mold was used by Funskool to create the 2nd Street Hawk figure, this time in just plain black. The T.A.R.G.A.T.s appear in DIC’s Operation: Dragonfire and that’s it really. Rounding off this band of not-so-merry men, we have #82, the Night Viper. Ah, ’82. Let’s talk about this number first. 1982 to be more precise. What a year. The Commodore 64 was launched, the second Hama massacre occurred (see what I did there? ), the Falkland War begins … and ends, E.T. phoned home, the US Air Force Space Command was founded, the first International Day of Peace is proclaimed (can we get that up to a week, month, year maybe? ), MJ released Thriller, Time magazine’s Man of the Year is ‘the computer’, I get thrown into this world and the world receives the Word of Hama, a (comic) book named G.I. Joe that should surpass the Bible in sales (Go to your local House of Worshipping and spend your dollars on new parables of Your True Saviors every week! Please, finish reading this post by your humble prophet first.). General Hawk and his 13 disciples take on the evil snake that would conquer the world if not for their bravery and courage. Let’s get back on track now and take a closer look at the Night Vipers. This is hands down my favorite Viper out there (until the Rap-Viper is officially released, that is. More below.). First released in 1989 the figure received 4 more iterations later on (I’m ignoring the hyphen issue). The original figure is iconic if you ask me. The dark green and black, the night vision goggles. Not to complicated, but really good. My only question is, what do they do when it’s light? I guess, it’s always night somewhere, so you could deploy them in the dark all over the world. The second version uses the same mold but with lame colors. It was part of Operation Flaming MOTH and came packed with a Frag Viper, both in shades of light green and brown. Version 3 was a Direct to Consumer Exclusive from the club in 2008. The figure came with 3 guns, a black helmet and web-gear. And more realistic looking night vision goggles. The color scheme was again dark green and black. Version 4 came in 2013 as part of the fourth wave of Retaliation figures. This one a perfect homage to the original version. It came with a flashlight… wouldn’t that render the night vision goggles useless though? Version 5 was released in 2014 as part of the 50th Anniversary and was bundled with Low Light (v8) in the Night Marksmen set. A simple repaint of the 2013 version, this time in red. Phew, that was quite the rundown, but we covered a lot of ground in this post. As a bonus, here is a custom built Rap-Viper by ozzie92. The club should have done a collab with Wordburglar and the customizer to get this as the final figure they release. And just because we can’t get enough of it… and – trust me – this song will stick in your noggin, here’s the official video by Wordburglar again. Enjoy. It’s like they just can’t take aim. And now they’re just overpaid. I wish for some Iron Grenadiers. It doesn’t have to be with Vipers. P.P.S. If you made it this far, you’ve read over 2400 words (longest blog post so far). Pat yourself on the back trooper and thanks. Really, thank you. I couldn’t have kept this blog alive without the support from the G.I. Joe collector’s community. Author European JoePosted on January 31, 2019 Categories G.I. 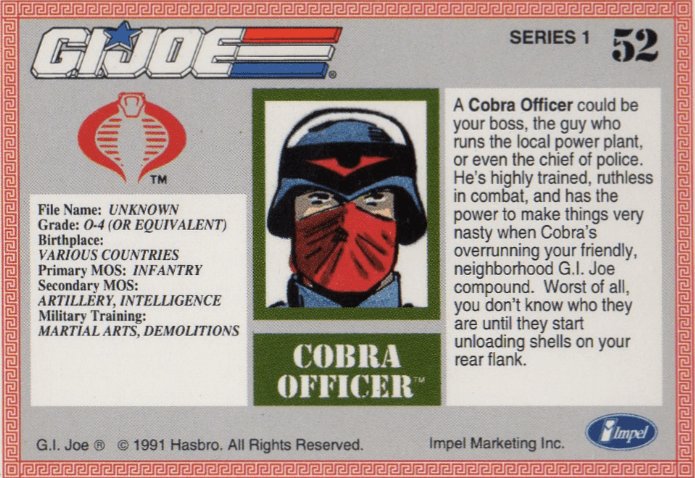 Joe, TCGTags #75, #76, #77, #78, #79, #80, #81, #82, #armybuilding, #long, #vipers, cobra, impel trading cardsLeave a comment on Do you want to build an army? Play that Funko music, Metal boy! I have to say it’s a lot shinier than I thought it would be, but it’s great to have Destro as an addition to my collection. Now I’ve got all the G.I.JOE (& Cobra) Funko Pops that are released. Snake-Eyes and Roadblock are getting outnumbered though, with 2 CC’s and 2 SS’s, and now Destro hogging all the shelf space for Cobra. Author European JoePosted on November 28, 2017 November 28, 2017 Categories Funko, G.I. JoeTags cobra, Destro, FunkoLeave a comment on Play that Funko music, Metal boy! Welcome back to the blog! This week’s post will be shorter than the last one 🙂 If you haven’t read the previous post on the Original Joe Team, do so now and then get back here to read all about the 1991 Impel Trading Cards #51 and #52 which we had to skip to add General Hawk to the team post. We’re starting this one off with #51, the Cobra Viper. The figure portrayed here does differ from the Viper figures. This figure is the Cobra (soldier) released in 1982 alongside the 13 original Joes and the Cobra Officer. CC was also available, but at first only through mail-in. The Viper (the figure with the cool looking visor helmet) was released in 1986. 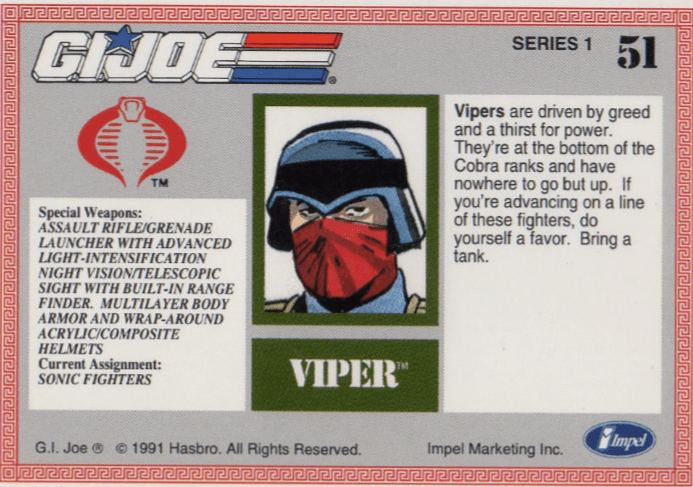 I guess that by 1991 (when the Impel Cards were released), the Vipers were commonly known as Cobra’s Infantry. The Vipers are the Cobra Greenshirts. Bottom of the hierarchy, but that doesn’t mean they’re not fearless. They are the ones that charge forward while CC is yelling ‘COBRA, Retreat!’. They are mercenaries, hired help, and if they have any doubts, they’ll probably end up being strapped to the Brainwave Scanner for attitude rearrangement. They are just generic troopers. Only one guy ever stepped up. Scarface. He was actually a Cobra Courier, but who’s saying that is better than a Viper? There are 29 (before you freak about that number, Snake Eyes has 70+ figures) figures released. Most of them in the distinctive Cobra blue with red sigil, but some have other colors. Still, the Cobra Royal Blue is a beautiful color and I prefer that to the other color schemes. #52 is the Cobra Officer. An evolved Cobra Viper to put it in Pokémon terms. In the army of the blind, the soldier with one eye is the general. The best of the worst. Cobra’s forces have never been very successful. A lack of competent leadership? Perhaps. I blame the middle-management. The Cobra Officers are just incompetent to belay and execute the delicate and precise winning strategies that Cobra Commander concocts. There have been 12 different figures of the Cobra Officer. Considering the 29 different Vipers we had, it’s safe to say that Officers have a better chance of survival than the Vipers do. That’s it for now. Next time we’ll listen to some Van Halen.